Chrichton's World: Review Musarañas a.k.a. Shrew's Nest (2014): More a drama than horror but rewarding if you stick with it! Review Musarañas a.k.a. Shrew's Nest (2014): More a drama than horror but rewarding if you stick with it! 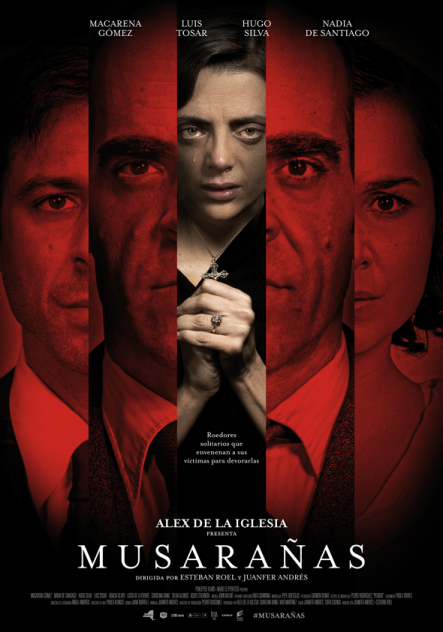 At first Musarañas has the appearance of a Gothic horror in the same vein as The Others. Actually it builds up a sense of tension and suspense like it's one. Only it's not. While some events are truly outrageous and could be perceived as far fetched they are very possible and that is what makes them terrifying. Musarañas does a good job of leaving you in the dark what it's about while giving you hints left and right. It sometimes even downright tells you but still you won't register until the very end. This is because main character Montse played by Macarena Gómez has our sympathy right from the start. Montse is plagued with agoraphobia and only has one person in her life she relies on which is her little sister who affectionately is called La Niña (Nadia de Santiago). No name is given. Not sure what the exact reason is to keep this a mystery but it does have a purpose. Things start to go wrong when La Niña has reached the age to be her own woman and probably ready and willing to leave the house and her sister. Just the thought of this makes Montse furious. Now a lot is implied of why that exactly is but you only will get to know about it in the end. Naturally anyone who is dependent on someone would be scared for losing that person. Obviously there is more to the story. When Montse is confronted with this fact her darker nature comes out and she lashes out against it in the only ways she knows. When she calms down though she shows immediate regret for having lost control. And I really have to give credit to Macarena Gómez because she is able to show that in her expressions without dialogue. Events really start to get in motion when charming and handsome neighbour Carlos (Hugo Silva) falls from the stairs and asks Montse for help. Montse does so but again a lot is implied of why that is. It is at these moments where the film misdirects you in such a manner that you almost feel ashamed for having thought the worst. Even though you most definitely were right for thinking so. As you can see I am being vague as I really don't want to spoil anything. Not that the twists are Earth shattering or anything. More so because of the emotions tied to them that will have an impact on you. Before I forget Louis Tosar as Padre has a significant role but is not in this as much in case you want to check out the film because of him like I did. However I am glad I did since the film is rewarding emotionally. So do give this film a shot.